The overnight storm included frequent lightning strikes, including one that set fire to a home on West River Road in Augusta shortly after midnight. A storm that dumped several inches of rain Wednesday night into early Thursday morning flooded roads throughout the region and sparked a house fire in Augusta. By the time it was over, several inches of water had soaked the area, including 4.5 inches in Wayne, 3.7 inches in Mount Vernon, 3.5 inches in Augusta, 2.95 inches in Winslow and 2.3 inches in Madison, according to the National Weather Service. In Chelsea, water washed out Town House Road, making it impassable. The storm included periods of frequent lightning strikes, one of which set fire to a home on West River Road. The fire at 748 West River Road, reported around 12:30 a.m. Thursday, damaged the outside of the 1800s-era, two-story home, according to Augusta Fire Battalion Chief John Bennett. A family of five, including three adults and two children, were sleeping inside at the time. All were able to get out safely. The fire broke out as firefighters were helping with flooding on Chase Avenue in Augusta. The request for help was canceled before Augusta firefighters arrived, Bennett said. The fire caused little to no damage inside the house. Central Maine Power Co. cut electricity to the home as a precaution. The family, who made their own arrangements for accommodations for the night, will be able to return to the home once it is checked by an electrician, Bennett said. The home, which is insured, is owned by James and Pamela Orr, according to city tax records. Around the same time the West River Road fire started, Augusta firefighters were headed to Chelsea for a report of a lightning-sparked fire at the home of Chelsea Fire Chief Shawn Ramage. The lightning strike near the home destroyed several rechargeable batteries and briefly filled the garage with smoke, Ramage said. Augusta firefighters were canceled when Ramage determined there was no fire. He believes there is only minor damage. Ramage and his firefighters later responded to Sewall Street in Augusta to help crews from that city, as well as Gardiner and Winthrop, douse a fire there. The cause of that blaze, which broke out around 6:30 a.m., hasn’t been determined, but it is not believed to be connected to the storm. The fire caused significant heat and smoke damage. Ramage said rain proved to be the biggest challenge for Chelsea. A section of Town House Road washed away, leaving a ditch Ramage estimated to be 5 feet deep, 10 feet long and 8 feet wide. Ramage estimated the road would remain impassible for several days, but there are alternative access points from each side. 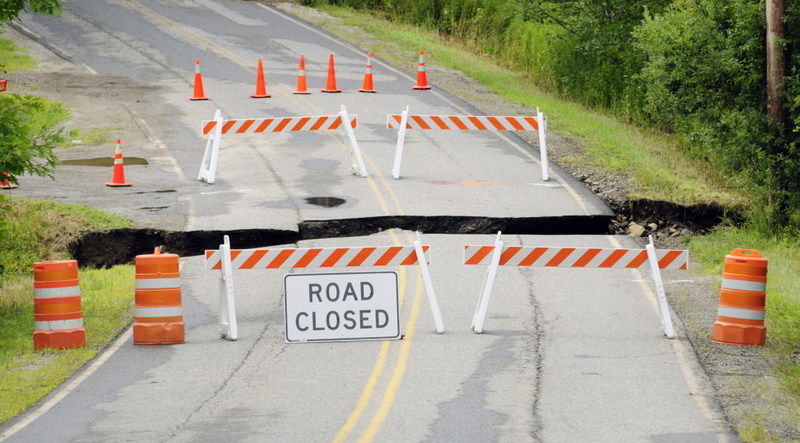 A smaller hole opened up on Dondero Road around 5:15 a.m. Thursday, cutting off several homes. A contractor was called to make emergency corrections, and the road was open again by late morning. 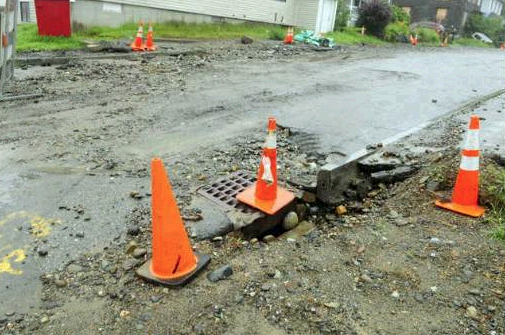 Flooding in Augusta included Mount Vernon Avenue and Cony Road near the Maine Veterans’ Home, where water washed out a portion of a culvert. 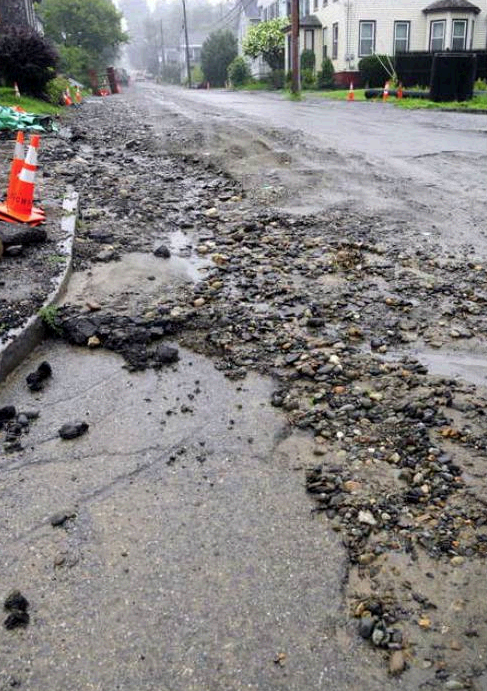 Augusta Public Works Director Lesley Jones said the culvert, which was recently installed, will need to be repaired. She said the city was still evaluating the damage done by the storm. 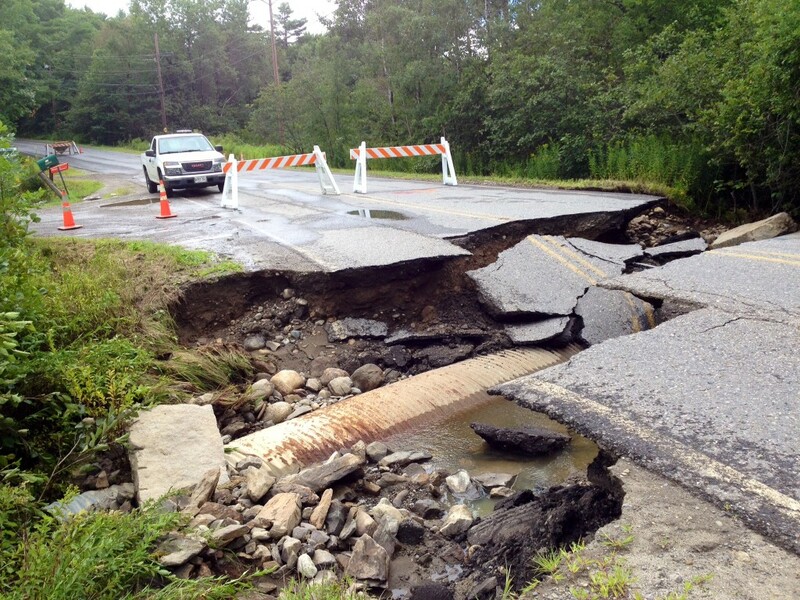 Winthrop, too, dealt with a number of flooded roads, said Capt. Ryan Frost of the Winthrop Police. Flooding was reported on Mount Pisgah Road near Bog Pond Road, Winthrop Center Road near Longfellow Lane and Route 133 near lot number 212. Stephen Dacorta, who was staying at a friend’s camp on Maranacook Station Lane, said he endured a sleepless night as a stream rushed past the camp toward nearby Maranacook Lake. Darkness and water prevented Dacorta from seeing a culvert that allowed the running water to pass safely under the tracks. He worried the trackbed itself was being washed away. “It was a little unnerving for a while,” he said. Dacorta notified police, who in turn called Pan Am Railways. Dacorta, who has been coming to the camp for decades, said he has never witnessed rain like that which fell during the storm. He said a bucket outside indicated about 5 inches of rain fell. He monitored radar on weather-related Internet sites. In Somerset County, a broken transmission line between Wyman Dam and Harris Dam caused power outages in the Jackman area, temporarily cutting off electricity to about 1,000 people, according to county Emergency Management Director Michael Smith. “We were very lucky. 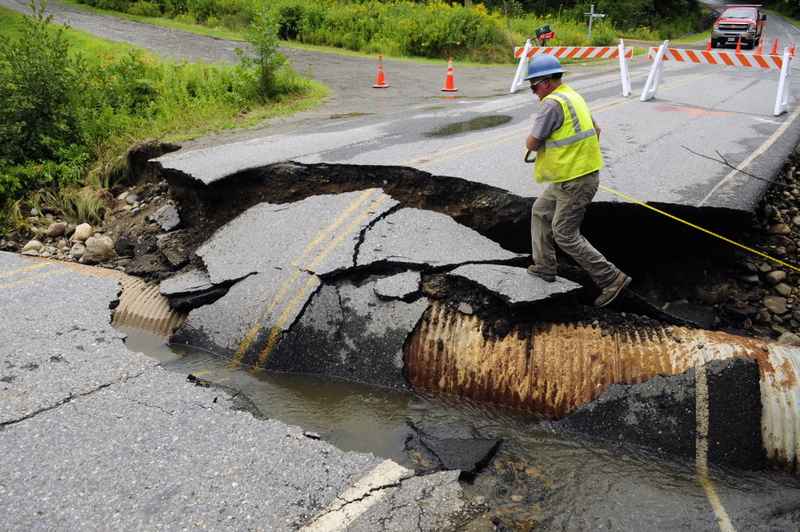 The storm didn’t hit too hard and the rain didn’t do too much damage,” Smith said. Crews in Farmington repaired a washout on Clover Mill Road near Temple Thursday morning, said Franklin County emergency management director Tim Hardy. “We had a few trees down here and there overnight and a few road washouts, but nothing significant has been reported yet,” Hardy said Thursday morning. Central Maine Power outages peaked at 10,500 households around 2:20 a.m., according to spokeswoman Gail Rice. Around 29,000 customers overall lost power at some point in the storm, she said. By Thursday evening, about 1,900 remained without power, mostly in Lincoln and Somerset counties. Rice said she expected everyone’s power to be back on Thursday. The Portland area got the worst of the storm, with 6.44 inches falling at the Portland International Jetport, according to the weather service. 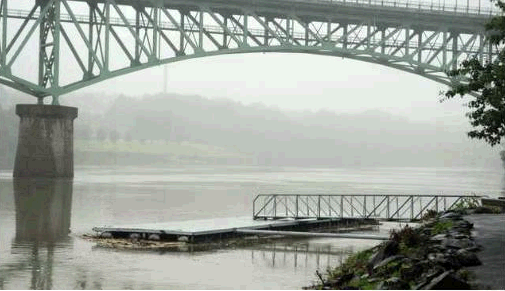 Most of that occurred between 9 p.m. and 11 p.m.
John Jensenius, a meteorologist for the weather service in Gray, said some small streams and rivers, especially in the Portland area, flooded, but there weren’t any flooding concerns with the Kennebec River. Staff writers Craig Crosby, Paul Koenig and Rachel Ohm contributed to this report.